There are 2 ferry routes operating between Sicily and Malta offering you combined total of 21 sailings per week. Grimaldi Lines operates 1 route, Catania to Valletta which runs 1 time weekly. Virtu Ferries operates 2 routes, Catania to Valletta runs 8 times per week & Pozzallo to Valletta about 12 times weekly. As the frequency and duration of crossings on some routes varies we would advise that you do a live search for crossings from Sicily to Malta to get the most up to date information. 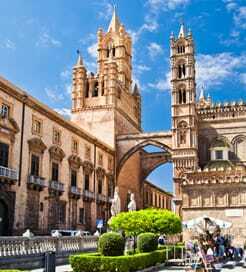 Sicily can be found to the south of Italy and is the largest island in the Mediterranean Sea, separated from the mainland by the narrow Strait of Messina. Situated at the meeting point between East and West, Africa and Europe, Sicily is truly at the crossroads of Mediterranean culture and offers much to see, to taste, and to do. With a varied landscape of glistening seas and restless mountains, the scenery creates a dramatic and lasting impression on those who visit. With a host of natural wonders and long warm seasons, Sicily is an attractive year round destination for explorers and holidaymakers alike. Sicily is a hub for ferry connections with ferry services operated by some of Europe’s biggest ferry companies travelling to and from most of the surrounding islands, ports on the mainland, Malta and North Africa via Tunisia. The nation of Malta is a small European archipelago to the south of Sicily, consisting of the inhabited islands Malta, Gozo and Kemmun. 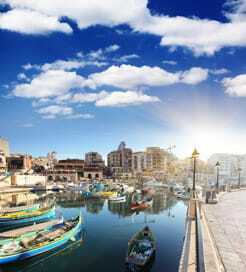 As one of the world’s smallest and most densely populated countries, Malta packs a huge punch, with a constant flurry of wonderful sights and sounds. Limestone cliffs contrast with bright blue sea and golden beaches whilst the aromas of the unique Maltese cuisine, a mix of Sicilian and Middle Eastern, tantalise the nostrils. Its long history, stretching all the way back to the fourth millennium BC, is always on show, with numerous museums and beautiful historic buildings found throughout the islands, particularly within the UNESCO World Heritage lauded capital, Valletta. Lying just eighty kilometres from Sicily, Malta is well connected to the Italian island by ferry, with frequent crossings all week from a couple of Sicilian cities to the Maltese capital.